Posted: Mon 11 Oct, 2010 9:39 am Post subject: THE WINNERS: Ready, Set, Donate! We just finished our Ready, Set, Donate contest! This contest had two great prizes donated by long-time myArmoury.com member Jean Thibodeau who also initiated this year's donation drive. 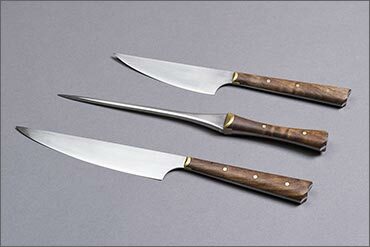 A custom one-of-a-kind knife set made by Michael Pikula. It consists of two knives and a pricker. 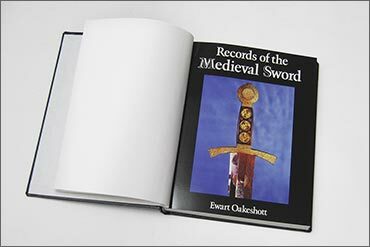 A special hardbound copy of Records of the Medieval Sword. Let's also thank Jean for donating the great prizes and doing so much for this site. I also want to thank all of the members who have contributed to help pay the bills around here and keep this place strong. You guys are the best. Take a look at our Pay it Forward Contest! Congratulations Steve and Mark. The prizes look like great additions to any collection. Thanks to both Jean and Nathan for offering thes up in the process of also giving all a chance to give something material back to sites such as this. Yes, congratulations Mark and Steve! Steve and Mark -congratulations. 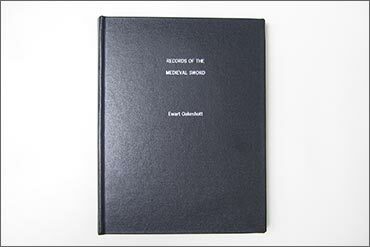 Mark, it will be great to have a copy of Oakeshott's "Records" where the pages don't keep detaching themselves from the binding. Congratulations to both Steve and Mark! Steve, please provide pictures of your Michael Pikula knife set unleashing major damage on a roast! Congratulations Mark and Steve, let us know your impressions of the book and the knife set when you get them. I know I appreciate my copy of the book a great deal as it's a classic and with the custom binding it just look great and doesn't fall apart unless you use a sword on it. 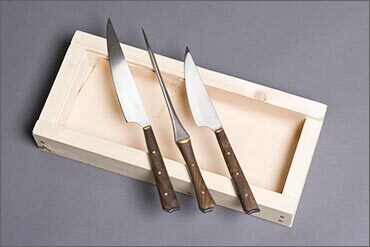 I haven seen the Michael Pikula knife set as it was sent directly to Nathan for use as a prize, I do have a nice little by-knife from Michael I bought recently that is a great kitchen knife but these are a bit more elaborate works. An as you probably know I have a couple of spears made by Michael and a cinquedea so I know first hand about the quality of his work. Glad the donation drive reached the goal amount and surpassed it by a small margin as this means that Nathan isn't out of pocket for the basic costs of running the site. Posted: Mon 11 Oct, 2010 2:57 pm Post subject: Wow! Thank you all! What a pleasant surprise - contests and I do not normally get along. I am very much looking forward to receiving, and using, this set! I'm a very happy and greatful recipient, having eyed off this book for some time ... thanks to all involved in organising this comp, and especially to 'Uncle' Jean for encouraging all of us to give something back!